Invoices, also known as a “bill,” “statement,” or “sales invoice,” are an essential part of your business. Without these documents, businesses of all-sizes wouldn’t be able to get paid for their goods or services, which means that they can’t pay their expenses or grow their business. Invoicing also allows to track and manage your monthly expenses, as well as validate that you reported your income to the IRS. Yeah. Invoicing is a big deal. To help you create and manage your invoices, here’s a guide to invoicing. 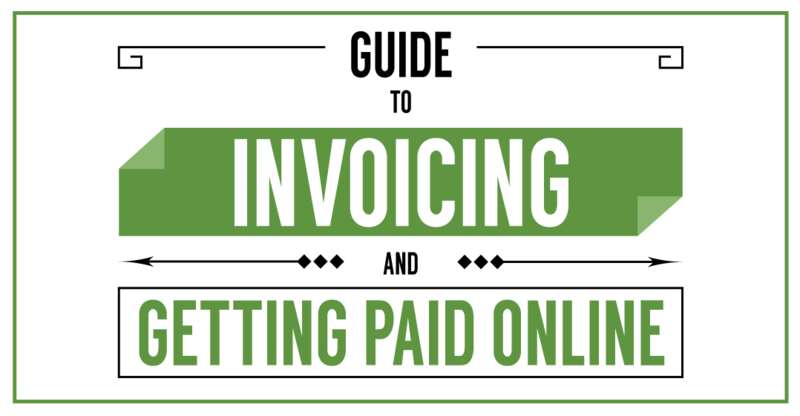 This guide will cover the correct invoicing format, getting paid online, and how to ensure that your invoices are paid on-time. The invoice header typically contains your business name, or full name if you’re self-employed, at the top of your invoice. Make sure that it’s in an easy-to-read font so that it’s not overlooked. The header should also include your contact information, which is usually placed underneath your business name. You should also include your client’s information to the invoice, such as the recipient’s name, address, and phone number. This is placed beneath the header, but on the opposite side of your contact information. If you do not have a physical address for the business or person that you’re invoicing, then you can simply add their name and email address. Regardless of how you want to number your invoices, always use a sequential order of when the invoice was created so that they’re easy to locate and organize. The payment due date is also up to your own discretion. However, a majority of invoicing systems use either a 30 day, 45 day or 60 day timeframe. Also be aware of your client’s pay cycle so that you’re both in sync. For example, if their cycle is every 30 days, and you invoice them on on the 15th, you’ll still have to wait 15 days for them to pay your bill. If you prefer to be paid immediately, then clearly state “Due upon receipt”. Underneath the due date you should specify your prefered method of payment. Do you want to be paid by check, credit card, or a payment gateway like PayPal? Date: This is the date that the service was performed or when a product was purchased. Quantity: This includes either how many hours you worked, how many tasks you performed, or how many products were sold. Hours: If you are paid by the hour, this column would contain how many hours you spent working on a specific task. Subtotal: This is the total amount that is being charged for your goods or services. Finally, you want to calculate the total, which is the subtotal plus sales tax, delivery fees, or any other additional fees. The total should be in bold so it stands out. Underneath the total you should include any additional information, such as terms and conditions, like your return policy or how many days the client has to pay before being charged a late fee. After analyzing more than 250,000 invoices, we found that you are 3x more likely to get paid if you add a company logo to your invoice. Also include your brand’s colors on your invoice. Blue, for example, conveys a sense of professionalism and trustworthiness, which may inspire a client to pay you faster since it proves that you are a professional. Invoicing used to be a lengthy process that included manually generating the invoice, mailing the invoice to the client, and waiting for their check to arrive. After that, you still had to wait several days for the check to clear in your bank account. Thankfully, technology has replaced antiquated payment options like cash and checks. Today you send invoices electronically and get paid online, which means that you can receive a payment in the same day you send out the invoice. Credit or debit cards. This is one of the most common methods used to accept payments. There are two ways that you can do this. The first is by setting up a merchant account with a bank. The second option is using a third party payment gateway like PayPal or Amazon Payments. This method can get expensive due to transaction fees. eChecks. You can also accept electronic checks through ACH processing, which is governed by the National Automated Clearing House Association. The client just simply adds their routing and account number, name, amount, and authorization) in an online payment form or software interface. The transaction fees are sometimes not as high as credit cards. eCash. These types of payments include electronic tokens or cryptocurrencies like bitcoin. Because the middleman is cut out, and the transaction is directly between the two the two parties, payments are fast and exclude those pricey transaction fees. Mobile digital wallets. Whether if it’s using Square so that a card is swiped on your mobile device or using an peer-to-peer app like Venmo or digital wallets like Google Wallet or Dwolla, accepting payments through mobile devices has become a popular option thanks to its convenience. Wire transfers. Even longstanding services like Western Union have gone digital by allowing you to send money to a mobile phone. Overall, wire transfers are fast and secure. They do, however, contain expensive fees. Click-to-pay email invoices. This is where you email an invoice to a client and they can pay that invoice by simply clicking on a link. It’s another fast and convenient method, but it can also streamline your reporting since it’s automatically noted in your system that the invoice has been paid. Subscription service or recurring billing. If you offer a monthly subscription service or are working with a client for the long-run, then you can automatically withdraw funds from their bank account or credit card for each month. This saves you the time from invoicing them each month. And, it ensures that you’re consistently paid. With invoicing software, such as solutions like Due, you can quickly create invoice and send them electronically. Not only does this save you a lot of time and money, invoicing software also comes equipped with features like storing client information so that you can easily create future invoices for recurring clients, time-tracking, automated payments, and scheduling reminders. Invoicing software also allows you to manage, organize, and track your invoices by letting you know which invoices have been paid and which have not. Timelines, such as when a project should be completed. Payment terms, like when and how you’ll be paid. The contract doesn’t have to be complicated. It just needs to be a simple document that ensure everyone lives up to their end of the bargain. If you just secured a large project that is going to place $6,000 in your bank account, it makes sense to break that sum into smaller amounts. For example, you could require a $2,000 deposit, with another $2,000 midway, and the final $2,000 following the completion of the project. This not only keeps the cash flowing while you work on the assignment, it also makes it easier for the client to pay you since it’s possible that they can come-up with $2,000 instead of the whole $6,000. Keep in mind that these should both be discussed when you and the client go over payment terms so that they’re not caught off-guard. Also, as a common courtesy, follow-up with the client before the invoice is past due. Again, most invoicing software does this automatically, but if you have a good rapport with the client you should email or call them to see what’s going-on. Studies have found that simply adding ‘please pay your invoice within’ or ‘thank you for your business’ to your invoice can increase the percentage of invoices that are paid by more than 5 per cent! Even if you’re using accounting or invoicing software that will notify you when an invoice has been paid or is pending, it’s still your responsibility to monitor this information closely so that you can maintain a positive cash flow. Becoming familiar with your software prior to using it so that you don’t make any mistakes. Scheduling the time send, review, or follow-up with invoices. For example, you could take Friday mornings to create new invoices and review which invoices have yet to be paid. If there are any outstanding invoices, then follow-up with the client. Have a plan in place for dealing with clients who don’t pay. If they ignore your follow-ups or late fees, then compose a letter stating that they’ll be taken to small claims court or warning them that the bill will be placed in collections. Routinely evaluate your financial records so that you can avoid any legal or tax concerns. Ask for you help when you need from a bookkeeper or accountant.